Most stories about Brooklyn these days have to do with gentrification, displacement and hipsters. 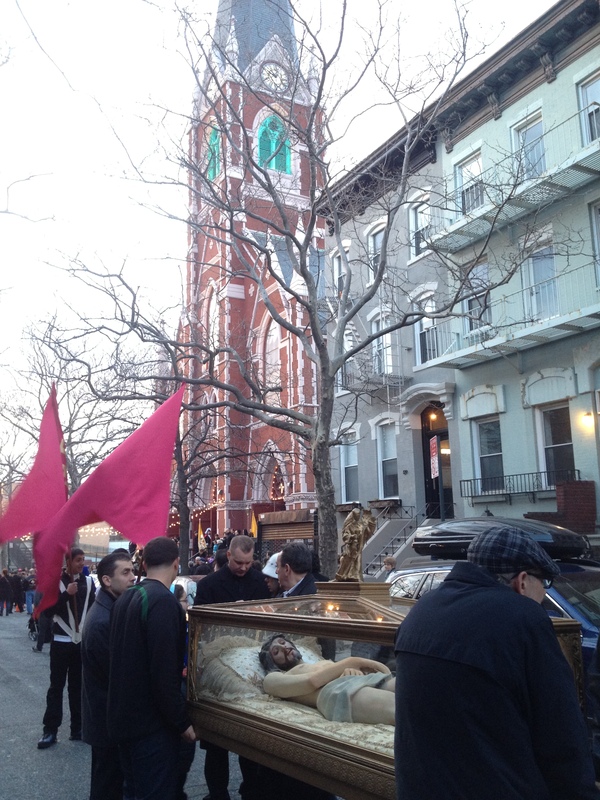 But during Holy Week, the streets of Carroll Gardens felt more like the heel of Italy circa 1920 than the land of cupcake stores and American Apparel. Court Street Pastry displayed marzipan lambs in its windows since before Palm Sunday. On Holy Thursday, a bus led pilgrims on a traditional visit to several local churches. And on Easter Sunday, sidewalks were filled with tulips, hyacinths and hydrangeas for sale. 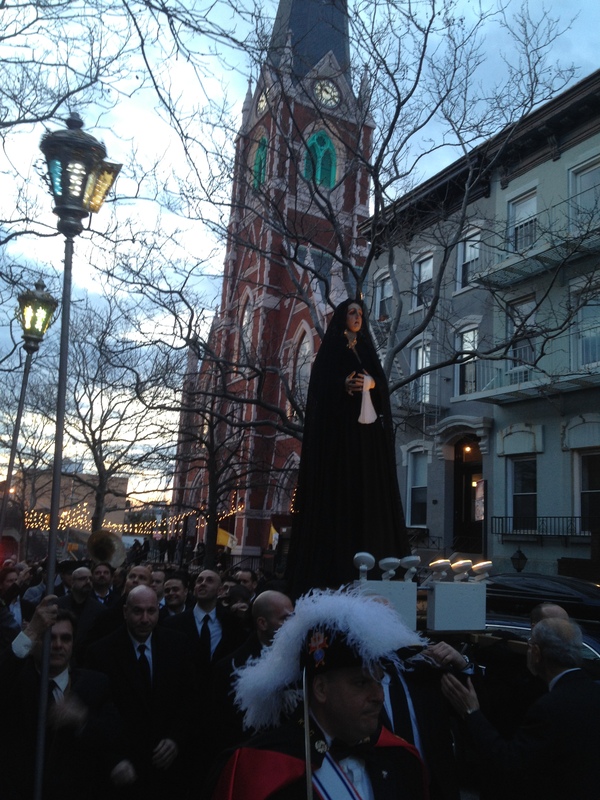 But the most impressive tradition was Sacred Heart and St. Stephen’s annual Good Friday procession through the streets of Carroll Gardens. I have wanted to attend this event since I moved here eight years ago; this year, I finally did. What I imagined would be a walk through three or four blocks of the neighborhood was instead a two-hour trip that zig-zagged as far as Court Street, 4th place, Degraw and then back to the steps of the church. 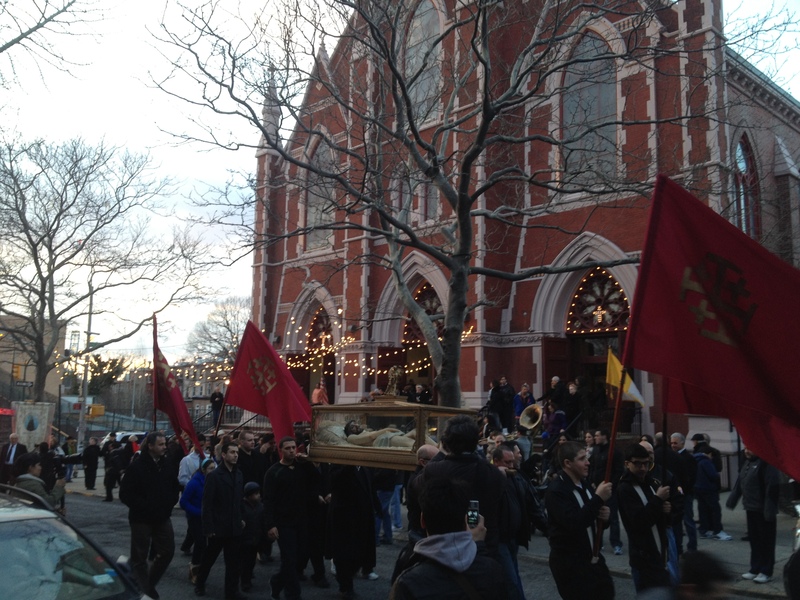 Leading the procession was a statue of the body of Jesus, encased in a glass coffin. This was followed by a statue of Maria Addolorata, or Our Lady of Sorrows, dressed in black and pierced in the heart with a sword. The statuary symbolizing both the Body of Christ and Mary the Mother of Jesus, under the title of Our Lady of Sorrows, have been used in the parish procession for 60 years and have both been restored in recent years. In a scene only experienced by many in a movie, the two figures are carried on the shoulders of the faithful accompanied by singing and music as they pass through the crowded streets. In conclusion, the bearers that carry the statuary through the streets re-enact the death of Christ by having the coffin of Jesus met at the feet of Mary three times before returning into Church. Women dressed in black carrying electric candles sang Italian hymns and prayed the Rosary in Italian, followed by a marching band playing traditional Italian hymns. Neighbors and surely scores who have left the neighborhood followed, often greeting old friends. And residents watched from their windows, sidewalks and front porches. 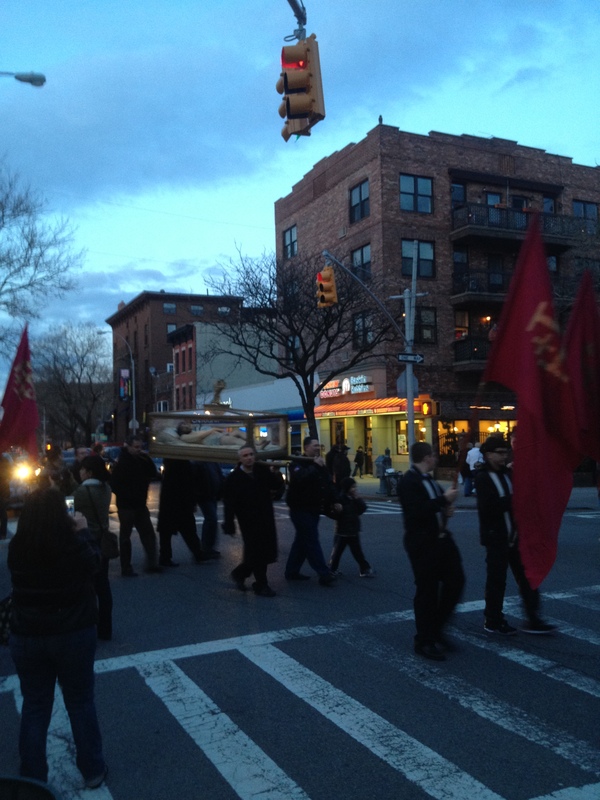 It’s good to see that some traditions still thrive in Brooklyn. 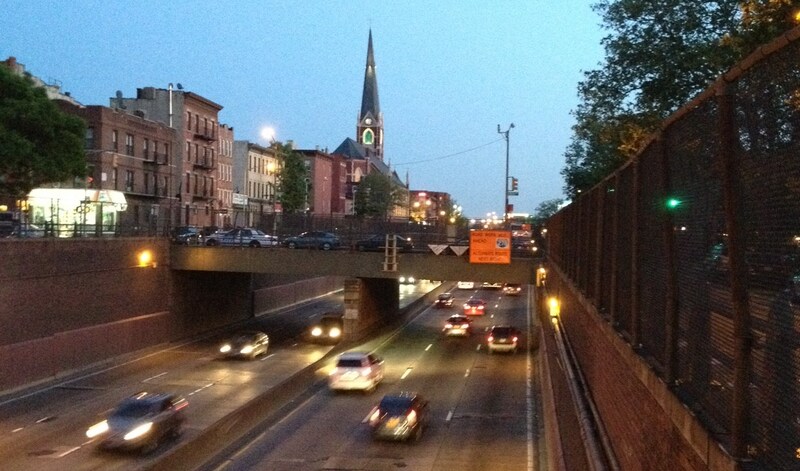 Sacred Hearts-St. Stephen’s sits on Hicks Street in Carroll Gardens, just above the Brooklyn-Queens Expressway. On my first real visit to New York, some 10 years ago, a leisurely walk through Brooklyn Heights and its surrounding neighborhoods brought me to Sacred Hearts-St. Stephen’s Catholic Church in Carroll Gardens. Designed by Patrick Charles Keely in the late 19th Century, this Gothic revival church suffered a devastating fire in 1951. By then, the parish was largely Italian American—as evidenced by the names on the stained-glass windows. One of the stained-glass windows, however, stopped me in my tracks. 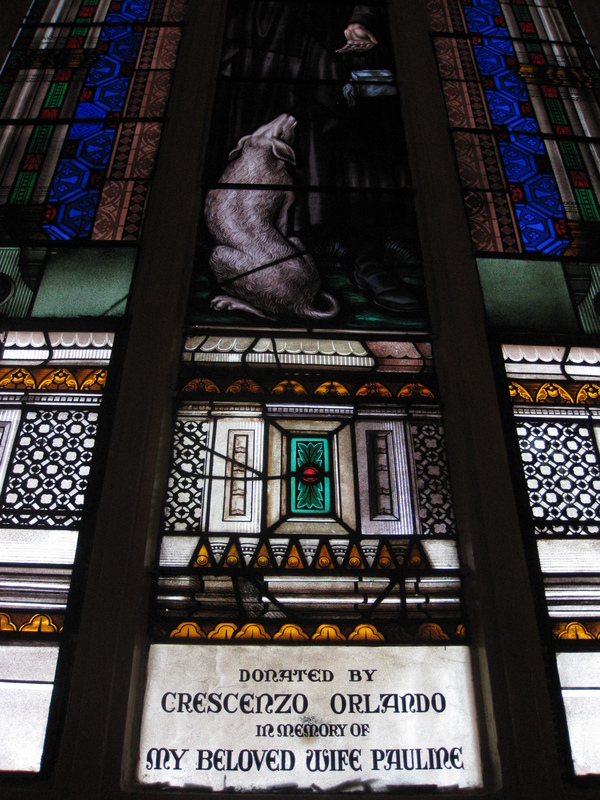 The name inscribed in the window is Crescenzo Orlando. My mother’s maiden name is Di Crescenzo. And her paternal grandmother’s maiden name is Orlando. Both names are common in the town my grandfather was born in, Guardiagrele, in Abruzzo, not far from the Adriatic Sea. Though family members on both the Di Crescenzo and Orlando sides of the family tell me that relatives of ours worked on sewers and aqueducts in New York City around the turn of the 20th century, I have no evidence that anyone from the family settled in New York City. The Orlandos moved to Putnam Valley, N.Y., while the Di Crescenzos settled on the south side of Chicago. Surely, however, there has to be some family connection, or at least a connection to Guardiagrele. A local historian suggested I look at neighborhood census records around the time the church was restored after its fire. But thus far I have not undertaken that task. Only two years ago did our side of the family learn that my great great grandparents are buried in Putnam Valley. It was good to learn that I had a family connection to the state of New York. I’d love to find out whether I also have a family connection to Carroll Gardens, Brooklyn.